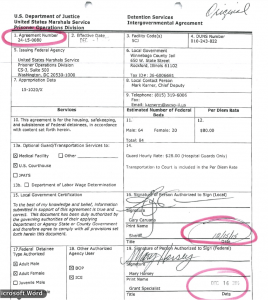 Almost two years after Winnebago County Sheriff Gary Caruana signed an agreement in 2015 to permit the U.S. government to house federal detainees in the county jail in Rockford, word got out that U.S. Immigration and Customs Enforcement (ICE) was planning to piggyback off that agreement to house immigrant detainees being processed for deportation. Sheriff Caruana had originally approved the Dec. 2015 contract with the U.S. Marshals Service to help support the jail’s tight budget. The contract provided that the county would be paid $80 per inmate for an estimated 84 beds, for both male and female prisoners. The sheriff said he was approached by ICE about the vacancy of about 500 beds, with a proposal to continue the payment agreement of $80 per inmate. He had also expressed an interest in hiring more officers at the jail with the additional funding. Service to help support the jail’s tight budget. The contract provided that the county would be paid $80 per inmate for an estimated 84 beds, for both male and female prisoners. The sheriff said he was approached by ICE about the vacancy of about 500 beds, continuing the payment agreement of $80 per inmate. He had also expressed an interest in hiring more officers at the jail with the additional funding. Caruana said he was 90 percent certain he was about to proceed with the contract adjustment after Donald Trump took office when he heard that local groups were alarmed by the prospect of having an increased ICE presence in their community. Caruana had been in office only a year and was elected as a Republican. He became the first Republican to hold the office in 40 years. In Aug. 2007, the prior sheriff, Richard Meyers, had formally requested to have the county participate in ICE’s 287(g) Secure Communities program that would train county officers to assist ICE in identifying and arresting illegal immigrants. Almost four years later, in April 2011, during President Obama’s first term, then Illinois Governor Patrick Quinn announced that he intended to have the entire state opt out of the program, informing ICE that according to ICE’s own data, the federal agency had violated its agreement with the state that the program’s purpose was to identify and deport immigrants “who have been convicted of serious criminal offenses.” Statistics showed that that nearly a third of immigrants deported from Illinois under the program had no criminal convictions, according to the New York Times. Nonetheless, the Dept. 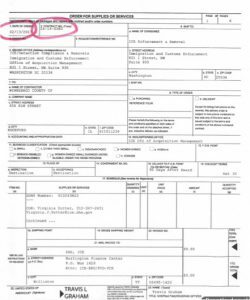 of Homeland Security under Obama notified the governor that Illinois could not decline to assist federal immigration authorities. By this year, there was a different president, a different governor, and a different sheriff for Winnebago County, all Republicans. Activist organizations held forums that gave residents opportunities to voice their opposition to the detention center. 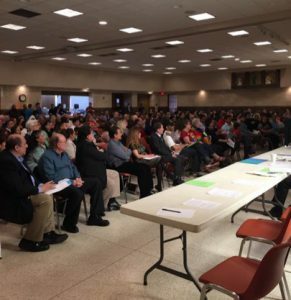 Hundreds of residents attended the three forums organized by the YWCA, the Coalition of Latino Leaders of Rockford, and the League of Women Voters. Representatives from ICE also met with the community. More than 1,000 Winnebago County residents petitioned against the detention center. “Most people were completely clueless” about the cause of the fears of the immigrant community, said Linda Zuba, an attorney in Rockford who hosts events to help undocumented immigrants learn about their rights. The organizations pushed hard and the sheriff’s office pushed hard back, Caruana said. But by the end of the series of meetings, Caruana said, he didn’t even have to heed the petitions. Rally turned into celebration.May 25, 2017. Caruana ultimately rejected the deal, according to the Rockford Register Star, because ICE failed to meet his five basic principles for holding an immigrant detention center within the county jail, The principles included transparency with the county’s community and retention of the sheriff’s authority over who is housed in the jail. ICE specifically declined to guarantee that only serious felony criminals would be detained in the jail. With that, the sheriff refused to enter into the agreement to have an ICE detention center, he said. The ICE representative involved in the negotiations did not respond to messages. 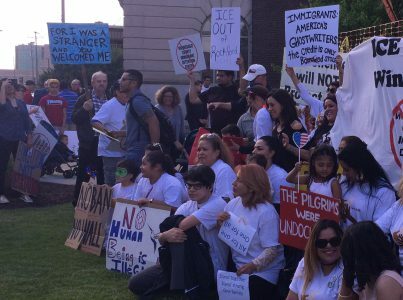 After Caruana stated on May 25 in a formal press release that he would not make a deal with ICE, what was originally supposed to be a protest outside of the Winnebago county board meeting area turned into a celebration. Prior to the announcement of Caruana’s final decision, Sara Dady, an immigration lawyer in Rockford, worried for her clients, as some of them discussed the possibility of leaving Rockford out of fear that the presence of ICE would increase. Luz Ramirez, vice president of La Voz Latina of the Rockford YWCA, observed similar fears within Winnebago County’s Latino community in response to the consideration of the detention center. “I have heard that families are not sending their children to school, [and] families are not leaving their homes,” Ramirez said. questions about their safety. Immigrants, both undocumented and documented, have been wary of authorities, with reports that arrests have increased significantly since Trump took office. Dady especially felt overwhelmed by the effects of President Trump’s Jan. 25 executive order, which authorized ICE to crack down on sanctuary cities and increase the number of immigrant arrests. In the 100 days after the order was issued, 41,300 undocumented immigrants were arrested by ICE, marking a 38 percent increase from the corresponding time period in 2016. The federal agency has touted its performance on the ICE website. 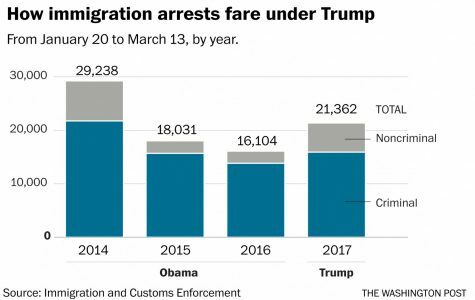 Graphic from the Washington Post’s story, “ICE immigration arrests of noncriminals double under Trump,” April 16, 2017. As an immigration lawyer, Dady has observed that increased detention has only made it more difficult for ICE to manage the number of detained immigrants waiting for trial. 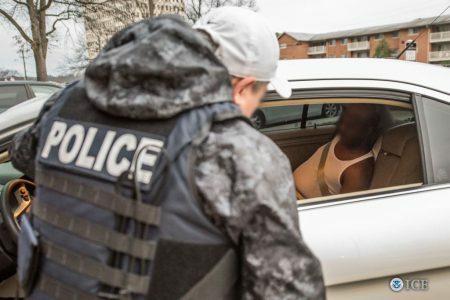 “ICE has way too many people, way too many cases, yet they’ve been directed to do even more arrests when they can’t even handle the ones they have now,” Dady said. Communicating with clients placed in detention has also made the job of immigration lawyers more challenging. Jeffrey Heller, a former adjunct professor at the Brooklyn Law School, said that it is especially difficult to contact detained immigrants because of their limited access to phones. Although immigrant detainees are granted the right to one free phone call, Heller said that they often have to pay for phone usage beyond that. This can be extremely difficult for detainees who do not have the financial means to do so. Limited contact with the outside world also poses an obstacle to immigrant detainees in search of pro bono lawyers to defend their cases. In addition to difficulties in finding legal assistance, many immigrant detainees share an experience of trauma when placed in jails for detention. Because of the impact detention has had on her clients, Dady is firmly against placing an immigrant detention center in Rockford. Overall, residents feel that the sheriff’s rejection of ICE’s proposal has left the community stronger than before, and it has been an eye-opening experience for some. Zuba said that she was shocked to see how little some of the elected officials of Rockford knew about the impact an immigrant detention center could have. “One thing we have discovered is the number of community leaders who really had no grasp about what’s happening with the immigrant community because it’s not affecting them,” Zuba said. Dady said that the controversy over the detention center has given local elected officials the opportunity to learn more about the complexity of immigration law. *The story has been revised since its original publication on June 9, 2017, to clarify some points and provide more historical context.